Sometimes inspiration comes at the most inopportune time… I’m pretty sure I’ve written some great blog-worthy material in my mind recently while driving or on the treadmill. I’m not at all lost right now, but I AM going through the process of putting all the new pieces into my world and trying to figure out how they all fit. Spending time with my chick is pretty high on the priority list. And practicing guitar cause I get heckled slightly when I can’t keep up. All good fun! Loving it. Still trying to redesign my nutrition routine to not throw away so much food since I’m not home nearly as much. I ate a chicken breast yesterday even though I wasn’t entirely sure when I cooked it. I didn’t die, so I guess it was ok. And feels like the water component has gone completely off the deep end. Pretty sure I’m pretty dehydrated 99% of the time but I’m trying to fix that. My legs tell me it’s worth the effort. 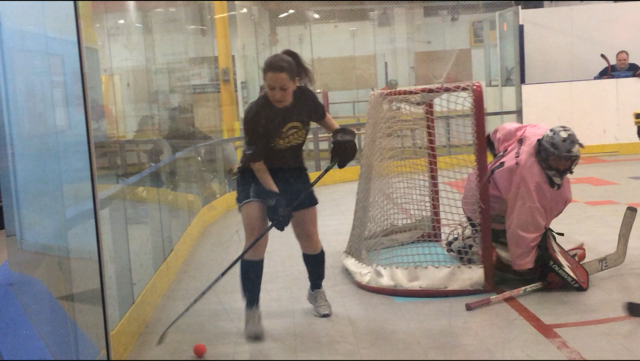 Ball hockey started this past Friday in Hamilton. Co-ed 3 on 3, similar to the hockey I played two winters ago at Laurier. Good times with a very entertaining group, and a good little warm-up for Acton ball hockey in the big arena which starts Sunday I think. Also trying to get into a rhythm of sharing my time between running and crossfit. Up till now I’ve pretty much just added the running, but I’m not sure that’s sustainable. Time will tell I guess! The running is intended to serve multiple purposes, so I guess time will tell if that proves effective as well. First – hockey needs running. Second – want to run some races with speedy Amanda this summer. Third – I was invited to a slip and slide party and want to look hot in a bikini. So, the third reason is probably the main reason but all are important. Who doesn’t want to look good in minimal clothing when the summer is approaching though? I’m not sure if Coach Dave has given this little training phase we are starting a name, but if today is any indication it’s going to be nasty. The names I came up with aren’t really posting appropriate either. This week’s little side challenge is right up my alley though! 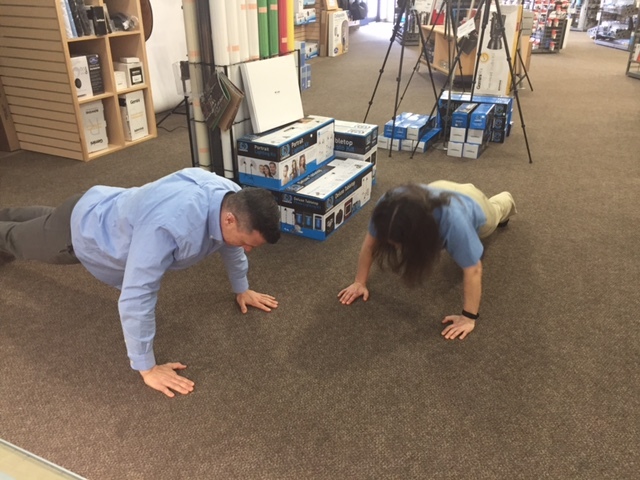 Last week was 100 push-ups, the last 25 of which I roped DK into completing with me at work. 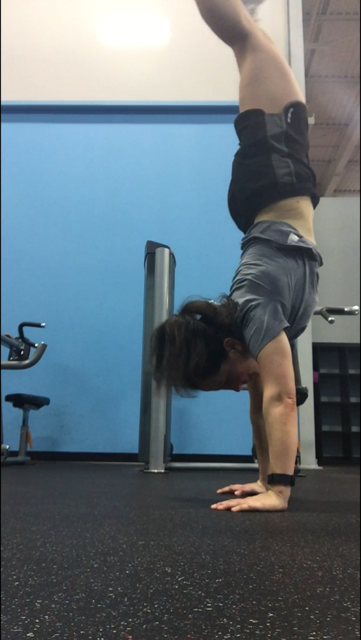 This week is accumulate 2 minutes of handstand holds every day. Crushed it today in 3 sets that should have been 2. 45 second, then 1:05, then 10 seconds to wrap it up. Tried hard to make the 1:05 1:15, but when the ground starts creeping itself closer to your head I usually take that as a hint to bail. It’ll come! Sounds simple, right? Part 1 was tedious and sweaty. Oh wait, so was part 2. Tedious, sweaty and HEAVY. I know, 85 isn’t that heavy… but it was today. Air squats felt heavy today after my brilliance yesterday. I don’t even know if the weighted vest part was by design in this workout, but when I looked over and another athlete was wearing one it seemed like a great idea. 20 reps in, I second-guessed that decision. Later when I headed for my Sunday run after work, I realized my legs were pretty angry about it lol. After at least 10 minutes of considering giving up, I got it together and had a decent run.